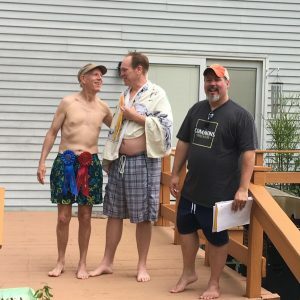 Have you ever been to an outdoor gathering where it was so hot (even with a cold brew in hand) that you said “If I find a pool, I swear I’m going in with or without clothes!”? 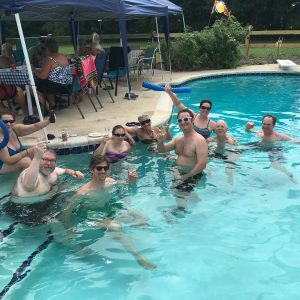 Well, there was no skinny dipping, but BURP’s July meeting held at the home of Bruce Bennett and Nancy Cozier in Nokesville, VA was just one of those gatherings. Many thanks to Bruce and Nancy for hosting the small but rowdy group of BURPers for this summer’s pool party. The monthly competition was for the Best Session Brew, which we loosely defined as 5% ABV or below. 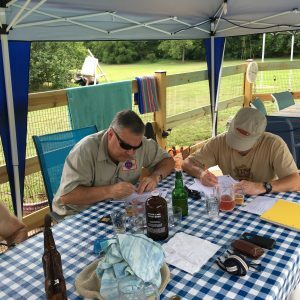 Special thanks to Tom Cannon and Pat Crowe for judging July’s competition, which had five entries, including a session American IPA (21A), a Witbier (24A), a Trappist single (26A), a Kolsch (5B), and an international pale lager (2A). It was no easy task determining which of the brews would float atop the proverbial competition pool, but when the bubbles cleared, Bill Ridgely’s Session American IPA and Witbier finished strong taking first and second place, respectively. Ralph Barthold’s Kolsch came in a close third. Congrats to Bill and Ralph, and see below for Bill’s American IPA recipe. As a friendly reminder, MASHOUT will be held during August 18-21, and there will be no monthly competition. We’ll see you in September 24th at Seneca Creek State Park for BURP’s annual Oktoberfest! Bill encouraging Ralph to show off his “ribbon” the right way.